A7.The Server sends a Set-Cookie: name=value to the client, in response to the header to set the field. If there is a cookie then the client sends a Cookie: name = value in its request header. a)Find the intersection of A and B.
Q38.Write a code in C that can print “hello world” without using any semicolon in the code. 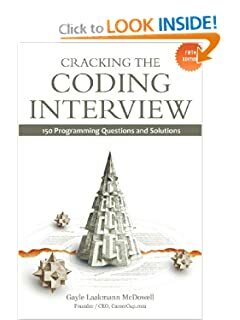 Q54.Write a C code for 'tr' program. 'tr' has two command line arguments. They both are strings of same length. tr reads an input file, replaces each character in the first string with the corresponding character in the second string. eg. 'tr abc xyz' replaces all 'a's by 'x's, 'b's by 'y's and so on. ANS. Q92.What is wrong in the following statement? a)3 type of vehicle:Motorbike, Car, and a car for the handicapped. b)3 type of parking:Motorbike parking, Car parking and handicapped car parking. c)Motorbike and Cars can park only at the designated parking, but the handicapped can park either on their own parking or the regular car parking. //The list is reverse with prv points to the start of the list. //maxSum contains the max possible sum of a sub-array. And Start and end contains the respective indices for the sub-array. A3.That man was playing monopoly. A4. Mutexes and semaphores are both used to control access to resources like variables with can be used by various process or threads. But mutex is used when only one thread is allowed to use that resources, but semaphore is used when a set of thread can use that resource. Mutex is a semaphores when that set has only one thread. A5. DFS is an algorithm that is used to traverse along one edge and is explored without backtracking. A6.The Space complexity is O(logn), It is the same in case of a worst case scenario, but is o(1) in case of the best case scenario. After the partition minimum elements are sorted with O(logn) space. The other partition is sorted using tail-recursion.The quicksort with in-place partition uses constant space before making recursive calls.It makes O(logn) recursive calls thus needs O(logn) space. The worst case takes O(n) nested calls thus requires O(n) space. Best case makes O(logn) calls thus requires O(logn) space. In case we are sorting large lists, we have to consider the left and right variables as well, they will no longer occupy constant space. It will take O(logn) bits to index into a list of n items. A8.The Answer may vary on how you want to plan it, thus is left to the readers. A9.As the database is very large, it can’t be searched directly in memory. Partial files are created and search is done on these partial files. Here we sort it if not in alphabetical order. Then we use binary search to find the word. It will take O(logn) for each file. a)The intersection can be found procedure by using a variation of the merge function of the merge sort. one to know its presence. A13.It is a way of organising of information. It’s like a genie who knows where your every toy is in the room and he will also get you any toy that you wish from your collection of toys. It will search for the toys on the name if its a cartoon toy, or any G.I.Joe action toy, or any car toy. -The frequency and location of keywords within the Web page. -How long the Web page has existed. -The number of other Web pages that link to the page in question. finally-The finally block always executes when the try block exits, except System.exit(0) call. This ensures that the finally block is executed even if an unexpected exception occurs. finalize- This method helps in garbage collection. A method that is invoked before an object is discarded by the garbage collector, allowing it to clean up its state. A19. Traverse the first list and hash them to a hash table.Now take the second list and and while iterating over it check whether it is hashed or not, If not then push it to a new list. A20.Acknowledgments for data sent, or lack of acknowledgments, are used by senders to infer network conditions between the TCP sender and receiver. Coupled with timers, TCP senders and receivers can alter the behavior of the flow of data. This is more generally referred to as congestion control. In addition, senders employ a retransmission timer that is based on the estimated round-trip time (or RTT) between the sender and receiver, as well as the variance in this round trip time. a)Hashtable is synchronized, whereas HashMap is not. b)Hashtable does not allow null keys or values. HashMap allows one null key and any number of null values. c)One of HashMaps subclasses is LinkedHashMap, so in the event that you'd want predictable iteration order (which is insertion order by default), you could easily swap out the HashMap for a LinkedHashMap. A26.It's a made up expression using only the letters A-F, often used when a recognisable hexadecimal number is required. Systems use this to show how much memory has been freed or how much shouldn’t be referred again.It is a sign in debugging showing that you have made an error. A27.Dangling pointers are pointers that don’t point to a valid object of an appropriate type. They mainly occur when an object is deleted or deallocated, without updating the value of the pointer. So the pointer is still pointing to the deallocated memory. A28. Maximum and minimum can be found in 1.5n comparisons.Here we maintain the min and max seen so far. We compare in pairs. We compare the pair and compare the smaller one with the min and the larger one with the greater of the two elements. Thus we require a total of three comparisons for two elements. Thus 3n/2 comparisons. A29.Two-way merge sort should be used, as it divides the large data in blocks and sorts them individually, and merges them to sort the large dataset. A30.Create a suffix tree of the string of length N, Then for each M strings , do the search in the tree and if the small string gets exhausted while reaching the leaf node then the small string will be present in the larger string. A32.This can be done by taking the traversing to the end of one of the list and making the ptr->next = list2. Then sorting the new list obtained. //temp arr will contain the arr free of duplicates, which can be copied by to the original arr. a)Write a code that could reverse the order of an string. b)Now break the main arr from its blank space to obtain the words. c)Call the reverse word function to reverse each word in the string. d)Concatenate all the reverse string to get the final output. A36.It returns the name of a procedure that caused the error.And this function is place in the cathch block of a TRY CATCH construct. A37.For authentication one can encrypt the hash (MD5/SHA) of the data with a private key. This is known as digital signature.And secrecy / confidentiality is achieved by encrypting the data with the public key of the target user. A41.One of the problem in distributed database system is that the network is very unpredictable i.e. over the network on which the database is distributed.This makes processes such as 3-phase commit extremely complicated, and makes complexity grow exponentially with number of nodes and desired robustness of the database. ASP has limited oops support and no built in support for xml. Error handling system is very poor in ASP. ASP is not having in-built facility for validation of controls. Error handling is very good. A46.To find the size of an object type cast it to the type String. And use the method length() to it to find its size. a)Scan array in pairs and remember the largest-so-far and smallest-so-far in the arrays. b)On comparing the larger of the two strings with the largest-so-far and update it accordingly. c)Compare the smaller of the pair with the smaller-so-far and update accordingly. d)Done in less than equal to 3n/2 strcmp() calls. A52.No it is not continuous, It is fragmented. synchronized to simplify control and also to optimize performance. A55.The common approach is lock levelling. This strategy factors all locks into numeric levels, permitting components at specific architectural layers in the system to acquire locks only at lower levels. A57. The information that is encrypted with a private key assures the recipient with authenticity of the message to which the information is appended to. So the digital signature provides that the message was signed by the entity who owns the private key. Smart cards help business evolve and expand the products and services in the global market. A59.Given a sorted linked list, then we have to insert an element to it, so that the order is retained. We can do this by iterating two pointers, and by checking if the value is between those two pointers. If It is there then then we insert it by prv->next = element and element->next=curr. A60.Latches are sensitive to the duration of a pulse and transfer data only when switched on. They store the last unit of output. Flip-Flop: they are sensitive to a change in the pulse. So they transfer data only when there is a change, i.e. when the pulse drops or when it rises. And this value is not changed until the next change in pulse. A63.The four basics are abstraction, inheritance, encapsulation, and polymorphism. A65.We can compare two linked list by maintaining two pointers *p1, *p2 for the two list and then iterating both of them in the same loop. If anywhere the elements diff then the lists are not same, if till end all the elements are the same then they are the same. A67.Top command gives the lists of all the active process running on the system.Along with their details. A70.The number appearing 2 times is (sum of all the numbers in the array) - (sum of the numbers from 1 to n). For floating numbers multiply it with 100 and proceed. A71.The series comes out to be 4,12,28,........ So the 7th element of the is 60. A72.Time complexity is O(nlogn) and space complexity is O(n). A75.sleep() method send a thread to a non-runnable state.The thread keeps the monitors it acquired.i.e if the thread is currently in a synchronized block or method no other thread can enter this block or method. wait() also sends a thread to non-runnable state, but wait() is for an object. Not a thread. This object is the lock object.Before lock.wait() is called, the current thread must synchronize on the lock object; wait() then releases this lock, and adds the thread to the "wait list" associated with the lock. A76.If a parent process exits before a child process, then if the child process is separated from parent process, i.e. it is demonised then nothing happens to the child process, it continues to live. But if the child still has some file shared with the parent, then a the child is signaled and is terminated. A82.heterogeneous linked lists are lists which contain different data types as data in their node. We need void pointers to links these nodes. As they can store pointers of any type. A87.Without using any static variable or global variable, to find the kth smallest element, one can do a in-order traversal, and store the elements in ascending order and print the kth smallest element. A88.See how the decimal to hexadecimal is done. Coding it won’t be a difficult task. A92.auto pointer is used to delete those objects it is pointing to.And this can only be used on objects that are created by unbracketed new. But here array is created using new and only delete can destroy it. Thus due to mismatch, it causes memory leak. A95.There is nothing wrong with the code.It won’t show any complination or runtime error. A96.When the list is empty, then it will return true. A97.to kill a process, we use the “kill” command followed by the process id.See the man page for kill for various other options. A98.Level order traversal, left for the readers to do it on their own. A102.Keeping track of the median, using min and max heap. A103One solution is to use the while loop in 8 possible ways. A105.In a binary-search tree, the successor of a node is the left-most leaf node of the right child. Writing a function for the leftmost leaf and passing the right-child will return the successor. A109.To reverse a linked list, maintain two pointers, one present and one previous.And after each iterantion, move both the pointers forward and curr->next = prev. The function just follows the problem statement. 1.Sort the set by login order. 2.Search the first element greater than the given time. 4.From the set find the logout time more than the given set. A115.You can use binary search, or newton's method to find the cube root of a number. A117.Using DFS search and coloring will efficiently divide the set into the desired groups. A119.This can be done as follows: Use two array to store these numbers, and use each digit to multiply by using the basic rules of multiplication, by multiplying digits. A120.To implement a atof() of C, we can simply find the dot of the string and multiply to the digit to 10 raise to power to (the position of the digit from the dot - 1).The raised power will be positive id number id left to the dot, and negitive if right to the dot. A124.It can be done using a level order traversal. The functions: ConerToNum converts strings to number and Isprime checks if it is prime or not. A135.This can be done by reversing the list and printing it in order. A136.HINT:use the dot product of the two vectors. A140.Find the depth of the left-child and that of the right child and add them up. A141.Not a good, optimised solution. A144. Hash partition the strings into buckets, let each system distribute the buckets among themselves and find duplicates in each bucket separately.Finding a bucket separately is easy. A149.We want to have enqueue() over push() and dequeue() over pop(). This can be done by maintaining two stacks A and B. 1.enqueue(): Push the element to stack A. 2.dequeue(): Pop all the elements to stack B and remove the top element of stack B. And then pop all the elements and push then to stack A.
A150.Use binary Search on that range where the number can be found after the result of higher or lower is given on every guess. A152.Yes you can have two JVMs running on a single machine. But you can only run one at a time. A153.You should change the door. P(A) = ⅓. P(B) + P(C) = ⅔. Then the interview adds information on the set that P(B) =0 . so the P(C) = ⅔. While P(A) still is ⅓. As P(C) > P(A). Then change it to C.
3.Now add the user to file user_list located in the same directory as mentioned above. 4.then restart the ftp services by : /etc/init.d/vsftpd start. A159.Init() creates and loads the servlet, But if the servlet instance is first created through the constructors which is done by the Servlet container. We can’t write constructors of a servlet class with arguments in servlet as it will throw an exception. To overcome this init() accepts an SevletConfig object as an argument. ServletConfig object supplies a servlet with information about its initialization parameters. A163.To find the same data in a linked list, we iterate over a list and hash all the elements of the form <element , count > . Now the elements with count more than one will be a repeat in the list. 1.Maintain two indices, one at the start and one at the end of the char array of the string. 2.Now swap the two characters which are at the two indices pointers and increment the start and decrement the end one after each iteration, till start > end. A165.This can be done using a tree, having the assumption that each employee can have only one manager. 1.Convert the integer to binary form as string. 2.Iterate over the string and if ‘1’ occurs increment the count value for the higher bits. A167. Change the static method to non-static or use two variables. 3.Xor of all the elements in both the arrays should be equal to zero. A172.To have fast access all you need to do is have a hash mapped, access. You can achieve this by hashing, or a map table. A173.It will give a compilation error. A176.’a’ in Foo function is private, so can’t be set by derived class X.
A177.Using a map makes the operation constant time O(1). It uses red black tree for its implementation that has time complexity of O(logn). A179.cat filename | grep string. A180.To return distinct numbers from a list, we can use a random function.It generates a number between 0 to the max index of the list. And once the number is generated then that number is marked on a hash table, so that if that number comes up again, a different number is selected. A181.To check weather a string is a palindrome or not, one should reverse the string and check it which the previous string. If they are the same then it’s a palindrome else not. A183.Hint:use a min heap data structure. A184.A coin change problem, left to the readers. A186.In the program it must be cheacked how much memory is allocated using the ‘new’, that creates the object, and when the stack clears that object, after the program ends. 1.Give a start pointer to any node and let it be the start node. 2.Maintain two pointers, increment one my 1 and the second by two, from this we can know the pointers, that covers all the nodes. 3.Count the number of nodes from start to end. 4.At the half of the list, point it to the start and point the last one to the node at mid. A188.Select min abs value of x and y, max abs value of x and y. Find the mean of both the x’s and y’s. And the resultant would be the answer. b)For each element in that array find the complement number “element ± d” using binary search. A190.It can be syncronized using mutex. A191.This can be done by checking whether the string is a palindrome or not. A197.To merge two binary tree, Iterate over one tree and add thoses elements to the other binary tree. A202.It will show an error because only charachters and integers can be used in switch-case statements. a)Sort the rightmost half and merge. b)Use the insertion sort way. A208.To store a 10GB file using a 2 GB RAM, use two-way merge sort, that divides the file into small parts that can fit into RAM for sorting. These files are sorted using quicksort and stored back, then all are merged together to have one 10 GB sorted file. A210.To find the middle elemement of a linked list, first iterate over the list to count the total number of node in it.Then half the count and iternate to that element. A211.This can be done by using maps or hash tables of the form <word,count>. The list is then sorted on the basis of maximum count, and the top 5 words are then returned by the function. A212.A script can be used using the grep command. A214.To sort a stack, we can pop all the elements out to an arry and use the quicksort algorithm to sort out the array, and then the elements are pushed back to the stack. It can be pushed from behind or from the front depending on how we want the stack. A215.For the intersection of two array, we can use mapping functions. a)We can map all the elements of one array of the form <element,count>. b)then we iterate over all the elements of the second array, and increment the count if the element is found and if not then left as it is. c)All the elements in the map that have count greater than one are included in the intersection. a)we have stored all the prime numbers before that number. b)We increment the number and check all the numbers till we get a prime number. c)We check the number whether it’s prime or not from the list of prime numbers by dividing it from that list.And add the new prime number to it. b)Add 1 to sum if first bit is set. Add 2 to sum if second bit is set. c)Now proceed only for the 3rd fit onwards, for every odd bit set add 1 to sum, and even bit subtract 1 from sum. d)When sum exceeds 3 make it sum%3. Thus at any point, if sum==0 then its is divisible by 3 else it is not. a)Create a graph with 64 vertices. b)Each vertex will have an adjacency list of all positions where Knight can be placed.for example if the Knight is placed at the center of chessBoard, Knight can move 8 different ways. Adj list will be of 8 vertices. c)Apply it to the Knight throughout chess Board. A222.Rope is the best data structure that can be used here. A225.The functions checks if y is a power of 2. A226.One solution is that we go to the first floor and drop the egg, if it doesn’t break we go to the next floor.If it breaks we know it is the maximum floor from where the egg doesn’t break. The maximum number of tries is 100 as we can go to 100th floor without breaking it. A228.Make a cut at an angle such that it passes through the centre of the cake and from the center of the hollow rectangle which has been removed already. The cut must pass through pass through both the rectangles so that the two pieces have equal area. A229.x:probability that car passes in 5 mins window. A231.Place one white marble in one bowl and the rest of the marbles in the second bowl. bowl 2: 49 white marble , 50 black marble. Now you have 50/50 chance to survive if any one of the bowl is selected.He will survive if he selects the white marble bowl. And even if he selects the other bowl, he will still have an almost 50/50 chance to survive. A232.You should be the 20th person in line. A233.Prefer going 2nd as it has a chance of winning of ⅔.Try all possible cases to find the probability. A234.No one it taller as both are the same person. A237.To find out which box contains defective balls, we will name boxes from 1 to 10. Then from first box we take 1 ball, from 2nd we take 2 balls, from 3rd we take 3 balls and so on. So we have a total of 55 balls.Now assuming that all the balls are fine, the total weight will be 550gm.But it would be less due to the defective balls. Now if the difference is one less then it is due to 1 balls, from box one. If 4 less than the total then from 2nd box and so on. We have 4 quart of water. A239.It would take 17 mins in total. A241.Manholes are round so that they don't fall through the manhole.When the plane ordinarily flush with the plane of the street that is perpendicular to it. A242.It is because of the lateral inversion property of the mirror. Which can easily be proved. A244.They will move in a spiral way and will meet at the center of the square due to symmetry. A245.The two boys will go to the other side of the river and then one of them will return. Then one soldier will go to the other side of the river and the boy will return. This will keep on repeating until all the soldiers return. A246.We will conduct 7 races to know the top three fastest horses. A247.Here is a cheating part, the three give $9 dollar includes the tip to the bellboy.25/3 rent paid by each person and $2/3 to the bellboy. Totalling to $27. Now if we if we add $3 to it, $30 will be the final sum. A249.He can take the wolf, then the cabbage. Both of them will be safe at the other end. Then he can bring the goat with him, thus all will be safe. A250.Switch on first and leave it for 2 mins. Then switch on the 2nd and go to the room.Now if it is on, its switch is the 2nd one. If its off and hot then its the first one and is its off and not hot then its the 3rd one.